For 11 years Toby’s Foundation with your help has been working to stop canine epilepsy by funding canine epilepsy research and raising awareness of this devastating disease. We have made significant strides in the fight against canine epilepsy. We have helped increase awareness by bringing this disease to the forefront so people can more openly talk about it. We have encouraged people to share information so more informed breeding choices can be made. We have helped increase the number of blood samples available for research. We have raised funds thanks to your support and generosity for research to develop DNA tests and more treatment options for all dogs suffering from this disease. During the last 3 years of Dr. Patterson’s grant for the Australian Shepherd, three chromosome areas were identified as areas that may have genes causing or contributing to canine epilepsy in the Australian Shepherd. Though no gene has been found yet, the researchers are continuing to search. Canine epilepsy is a complex problem but it is one that can be solved. Each time progress is made we gain more insight into this problem. As we look to the future, researchers continue to work on this disease and we shall continue to do everything we have been doing and more. Blood samples and funding are still needed. Donations are critical to our efforts to stop canine epilepsy. I hope you know how thankful we are for all your support. Your generosity and passionate support for our work drives us forward and always gives us hope for the future. We cannot do this work without you. You are our much needed partner in the fight against canine epilepsy so our dogs can have a future without epilepsy. Thank you! 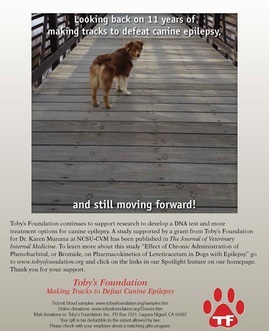 Toby's Foundation continues to support research to develop a DNA test and more treatment options for canine epilepsy. A study “Effect of Chronic Administration of Phenobarbital, or Bromide, on Pharmacokinetics of Levetiracetam in Dogs with Epilepsy,” supported by a grant from Toby’s Foundation for Dr. Karen Munana, has been published in The Journal of Veterinary Internal Medicine. Your gifts help us to support the research to find the genes responsible for canine epilepsy and develop a screening test. Please make Toby's Foundation part of your charitable giving. Toby's Foundation, Inc. is a non-profit 501(c)(3) organization. Our Federal Tax Identification number is 74-3135217. Your gift is tax deductible to the fullest extent of the law and helps us in our efforts to stop canine epilepsy. Please check with your employer about a Matching Gifts program. If you would like to make a memorial or honorary gift to support canine epilepsy research, an acknowledgement card can be sent to whomever you specify. Please also support us by visiting us on facebook and like us.